One of our most popular products is this Dawn Dusk Automatic Hen House Door Controller. 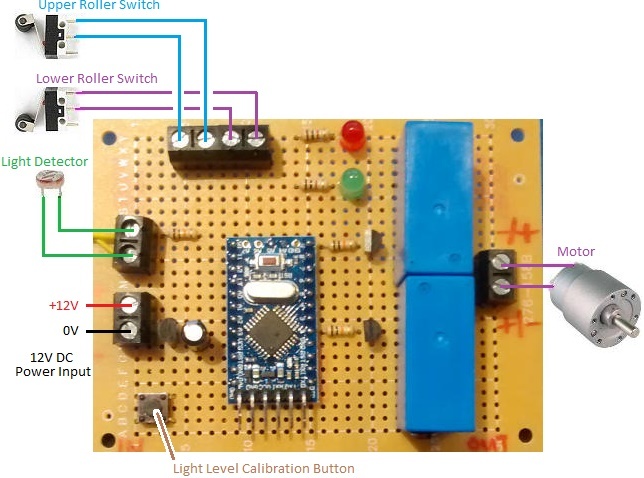 This device automatically detects dawn and dusk using a light detector calibrated by the user and runs a motor one way in the morning to open a hen house door, and the other way in the evening to close the door. Roller limit switches act to ensure that the door fully opens and closes without over or under running. Pictured below is a alternative but similar device which uses a programmable digital timer to set the times of day that the door is to open and close. When the timer turns on, the motor runs to open the door until the upper roller switch closes. Then when the timer turns off, the motor runs to close the door until the lower roller switch closes. The advantage of using a timer is that the door can be set to open later on weekends for example to reduce noise from the birds, and the exact times the door is to be opened and closed can be set independently of the level of daylight (and therefore of the weather). The disadvantage is that the timings have to be changed every few weeks as the seasons change and the days get longer and shorter. If you need any type of automatic poultry house door controller, please email neil@reuk.co.uk with details of your exact requirements. Pictured below is an automatic controller for a poultry incubator. The eggs in this incubator must be kept within a tightly regulated temperature range, they need to be automatically turned at regular intervals, and there is also a fan to be controlled. The owner of this incubator would like the temperature of the eggs to be kept between 37 and 37.5 degrees Celcius, so there is a heating element which is switched by an on board relay following the temperatures measured by a DS18B20 waterproof sensor. The eggs are to be turned every 30,45,60, or 75 minutes, and to do this the motor must run each time for a few seconds. Both of these timing intervals can be set by the user. The fan has three modes of operation – on, off, or automatic, and in automatic mode the user can select an interval of 5, 10, or 15, etc minutes on and minutes off repeating. All of the current settings and system status are shown on a backlit 16×2 LCD display (see above), and all user settings are programmed using this display and the two buttons on the controller board. If you need a controller of this type, please email neil@reuk.co.uk with details of your exact requirements. For details of an alternative incubator controller which also controls humidity, click here: Poultry Egg Incubator with Humidity Sensor. Pictured below is a hen house door controller which will automatically open the hen house door in the morning and close it again at night to protect the birds from foxes and other predators. 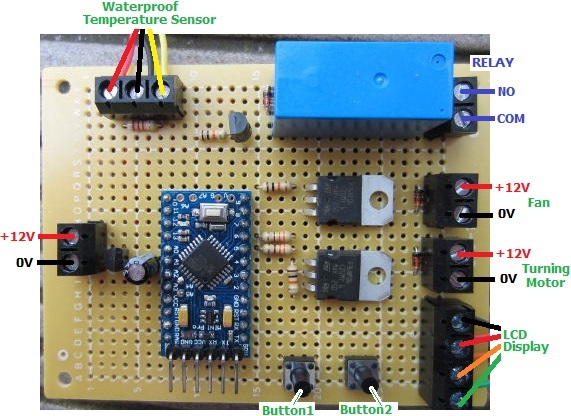 This controller is somewhat based around our Simple Hen House Door Controller which uses a low voltage programmable digital timer to set when the door should open and close. 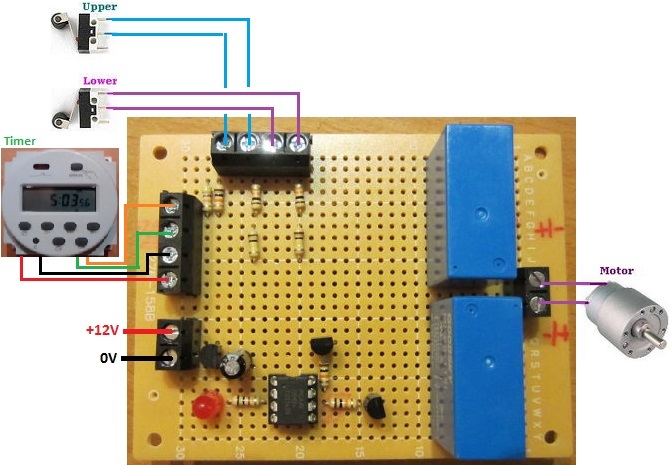 This version instead takes an input from a light detector (click here for our article introducing Light Dependent Resistors), and uses this to detect dawn and dusk. When dusk begins, the motor turns one way to lower the door until it presses against and closes the lower roller switch which acts as a limit switch. Similarly, when dawn begins the following morning, the motor turns the other way to raise the door until it closes the upper roller switch. (For the explanation of how the polarity of the voltage sent to the motor is reversed see our introductory article: Automatic Hen House Door Controller). 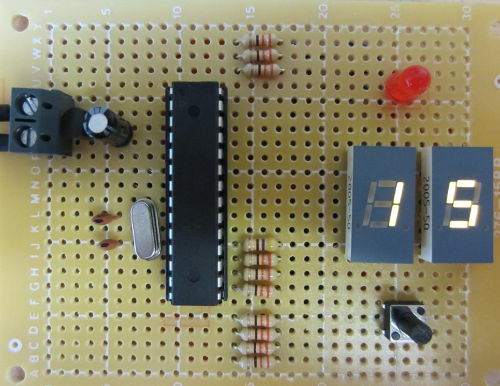 In order for the user to set the light level threshold at which day becomes night and night becomes day, a programming button is provided on the circuit board. When the ambient light level is at the level considered by the user to be the threshold, they press this button while powering on the controller to save that measured light level as the new threshold. The threshold is stored in permanent memory and is therefore not lost even when the controller is subsequently disconnected from the power. Pictured above is a functionally identical controller, but which is built around an Arduino Pro Mini instead of the PICAXE-18M2 used in the original. The instructions for this controller are available here: Dawn Dusk Henhouse Door Controller Instructions. If you need any type of door controller contact neil@reuk.co.uk with details of your exact requirements. Pictured below is a project we completed for a day countdown timer for an egg incubator. It is important to keep track of the number of days that the eggs have been in the incubator waiting to hatch. When the user turns on the incubator and puts in the eggs, he uses the button on the timer to programme in the number of days that the eggs have until they are due to hatch. The timer then starts, and every day the day count display reduces by one until it eventually gets down to zero and the eggs hatch. In order to build this we used a standalone Arduino set up. The external clock crystal gives pretty good time accuracy (used in conjunction with the Arduino millis() function). However, it is still essential to calibrate it to confirm it will be reliable over the 30 days or less that this incubator timer is likely to have to countdown. In order to calibrate we temporarily programmed the timer to countdown hours (3,600,000 milliseconds) instead of days and left it running for 12 hours. Using an accurate stopwatch we timed how long it took the timer to run for its ’12 hours’ to compare it with the real 12 hours of the stopwatch. We then calculated by how much we needed to increase or decrease the number of milliseconds in the Arduino ‘hour’ so that its hour would match a real hour giving a very accurate timer. With this particular Arduino chip and clock crystal combination the Arduino lost less than a second in 12 hours even before the calibration. To display the number of days until hatching we used two 7-segment LED displays which we multiplexed. Multiplexing takes advantage of persistence in the eye. If you light up one display quickly, then the other display, then the first again, and so on, the eye sees both displays on at the same time (as does a camera if the shutter speed is slower than the time taken to light up both displays – see above!). 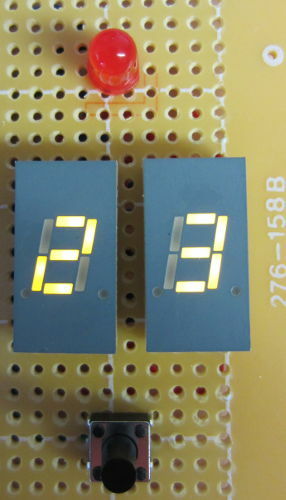 This technique makes it possible to control lots of LED displays without needing too many output pins on the microprocessor – just seven for the LED segments which are connected in parallel, and one for each display’s ground connection (if you use common cathode LED displays). 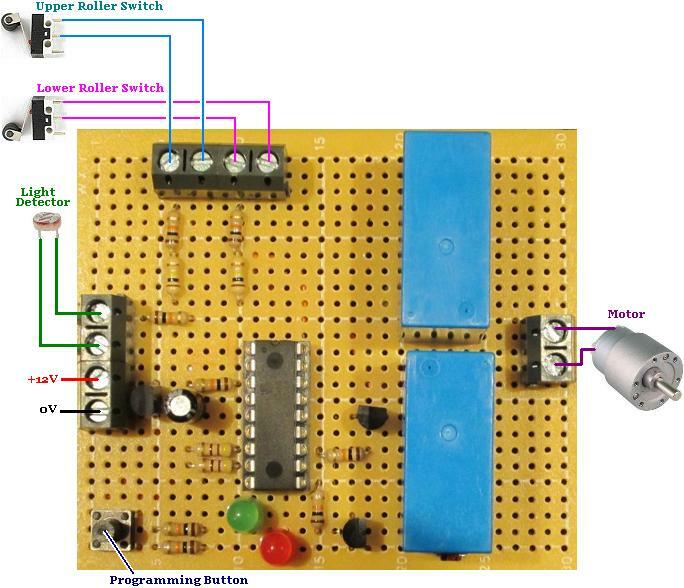 We have designed a new simple DIY automatic hen house door controller which instead of using a microcontroller, just uses a programmable 12V digital timer, two SPDT relays, four 1N4001 diodes, a couple of roller microswitches, and a high torque motor. Click here for full details: New Simple Hen House Door Controller.